Plugins are small pieces of code that can interact with NINJA-IDE and add specific features to it. This is useful if you want to have special features that NINJA-IDE does not provide. Many times developers around the world try to collaborate on an open source project, but that task could be hard for many reasons. In these cases plugins are a good option to collaborate. You just need to learn the project API. 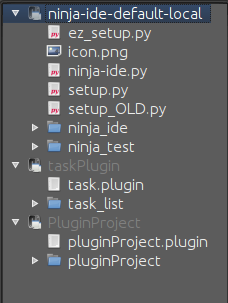 The image above shows the connection between plugins and NINJA-IDE. Plugins get services by using a service locator. The service locator returns the specific service and the plugin uses this service to talk with NINJA-IDE. We recommend that you install and use the official plugin called pluginProject. 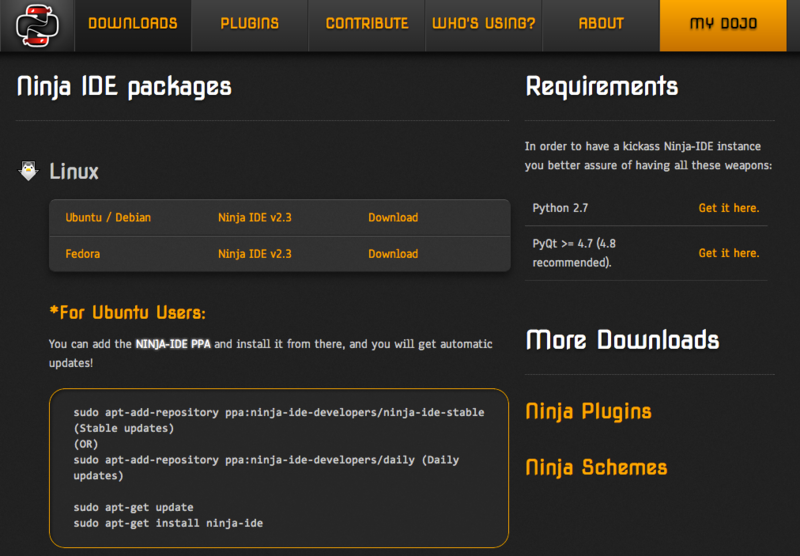 That plugin helps you to create the skeleton of all plugins for NINJA-IDE. That plugin allows you to test your plugin on NINJA-IDE as well and packages your plugin to share it. You can install**pluginProject** from the Plugin Manager inside NINJA-IDE (Go to the Plugins menu and choose Manage Plugins). "description": "This plugin is a test"
module: Indicates the name of the module where the plugin class resides, which will be instantiated by NINJA-IDE. class: Indicates the name of the class which implements the plugin. authors: String with the author(s). version: Indicates the plugin version. url: Indicates the url of the plugin (the documentation could be provided here). This class provides an easy way to request and get the NINJA-IDE services for your plugin. This class has two methods: one to get a service and one to get the names of all available services. All plugins must inherit from this class. This is the base class that NINJA-IDE provides to create plugins. This class also inherits from QObject. Because of that your plugins are compatible with signals/slots of the Qt library. self.metadata: A Python Dictionary with the contents of the plugin descriptor file. self.locator: An instance of the ServiceLocator class. self.path: A string with the plugin directory. self.logger: An instance of PluginLogger. This is the logger for plugins. It allows to record events occurred on plugins. This is a wrapper over the logging.Logger class of the logging module. This method is called by NINJA-IDE when your plugin is ready to start. This is the recommended place to request/get the NINJA-IDE services for your plugin. This method is called when NINJA-IDE is shutting down. This method is called by NINJA-IDE when the user opens the preferences dialog. This method allows us to integrate a custom configuration widget in the NINJA-IDE preferences. It is important that this is TRUNCATED! Please download pandoc if you want to convert large files. print "The plugin is loading..."
print "The plugin is shutting down because the user has closed NINJA-IDE"
Some actions from plugins require objects with special interfaces. Here we describe the possible interfaces. This interface is useful if you want to add a new type of project to NINJA-IDE. This interface is useful if you want to provide symbols for a language distinct of Python. This interface is useful if you want to add custom preferences for your plugin. Services are the way that plugins talk with NINJA-IDE. Conceptually services are proxies to NINJA-IDE components. NINJA-IDE defines different components, each one of these has different features. This service allows to interact with the main parts of NINJA-IDE, such as the editor, the tab manager, listen to signals which NINJA-IDE emits when saving a file, save project, change the current tab, etc. Emitted when the user presses a key. Emitted before the fileName is saved on disc. Emitted when the user saves a file. Emitted when the user changes the current tab. Emitted when the user executes a file. This method returns the TabWidget (ninja_ide.gui.main_panel.tab_widget.TabWidget) subclass of QTabWidget. This method adds an extra context menu to the editor’s context menu (QMenu). This method returns the name of the open file(s). This method creates a new editor. If the method is called without fileName and content an empty editor is created. This method returns the actual editor (instance of ninja_ide.gui.editor.Editor). This method could return None. This method returns the actual editor’s path. This method could return None if there isn’t an editor. This method returns the project where the current file in the editor belongs to, or an empty string (if the Editor Widget is not specified it returns the information from the current editor in focus). This method returns the plain text of the current editor, or None if there isn’t an editor. This method returns the selected text of an editor. This method could return None. This method inserts text into the current cursor position. This method returns the syntax for the current file. The syntax is represented as a dictionary that contains the descriptor that Ninja recognizes for each language (if the Editor Widget is not specified it returns the information from the current editor in focus). This method jumps to a specific line in the current editor. This method returns the count of lines in the current editor. This method saves the actual file. This method opens multiple files, each one in a different editor. This method opens a single file. If the file is already open it gets in focus. This method opens a single image. This service allows to interact with the toolbar of NINJA-IDE. The toolbar is an instance of QToolbar, so we can add actions (QAction) to it. This method allows to add an action (QAction) to the toolbar. Great! 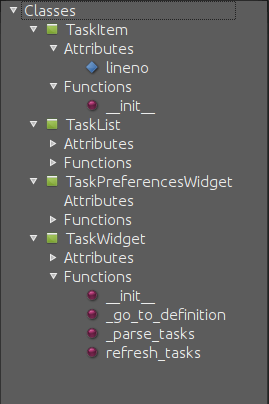 We have added an action to the toolbar of NINJA-IDE. This service allows to interact with the Plugins menu of NINJA-IDE. We can insert menus (QMenu) or/and actions (QAction). This method allows to add a menu (QMenu) to the NINJA-IDE plugins menu. This method allows to add an action (QAction) to the NINJA-IDE plugins menu. This service allows to interact with the miscellaneous container (misc) of NINJA-IDE. This container is at the bottom of the user interface. The container has a collection of widgets and shows an icon for each one them. Only one widget is visible at a time. We can add widgets (QWidget) to the misc container. The image above shows the misc container, the console and the icons. This method allows to add widgets (QWidget) to the misc container. my_widget = QWidget(...)icon_path = "some_plate/where/the/icon/is.png"
description = "This is my widget in NINJA-IDE"
Great! We have added a widget with a QWebView to the misc container of NINJA-IDE. This service allows to interact with the NINJA-IDE explorer container which holds the TreeProjectsWidget and the TreeSymbolsWidget. Before we explain the explorer service, we are going to see some important classes first. Return a ProjectItem based on the name provided, or None if an item with that name can’t be found. Add a new Symbol’s handler for the given file extension. Note: symbols_handler SHOULD have a special interface. See: ninja_ide.core.plugin_interfaces. Then all symbols in .cpp files will be handled by cpp_symbols_handler. Add a new Project Type and the handler for it. Note: project_type_handler SHOULD have a special interface. See: ninja_ide.core.plugin_interfaces. Then ‘Foo Project’ will appear in the New Project wizard and the foo_project_handler instance controls the wizard. Add a tab (QTabWidget) with the given title (string). Returns the path of the opened projects. Returns a list of strings with the paths of the opened projects, or an empty list if there aren’t any opened projects. Add an extra menu(QMenu) to the project explorer for files that are specified by lang. Note: lang is a file extension such as .php, .py, .cpp. If you want to add an extra menu for any kind of file, you need to specify lang=’all’. Emitted when the user executes a project. Emitted when the user opens a project. This class inherits from QTreeWidget and represents a tree with all the NINJA-IDE projects and their content (folders and files). This class inherits from QTreeWidgetItem and is used to represent projects (root of tree). Returns the programming language of the project. Returns the full path of the project. This class inherits from QTreeWidgetItem and is used to represent the content of projects (folder and files). This class contains general information about the file. self.path: Absolute path to the given item (folder or file). self.isFolder: Boolean value depending on the item is folder or item. This class inherits from QTreeWidget and represents the content of a file classes, methods, functions and global variables. 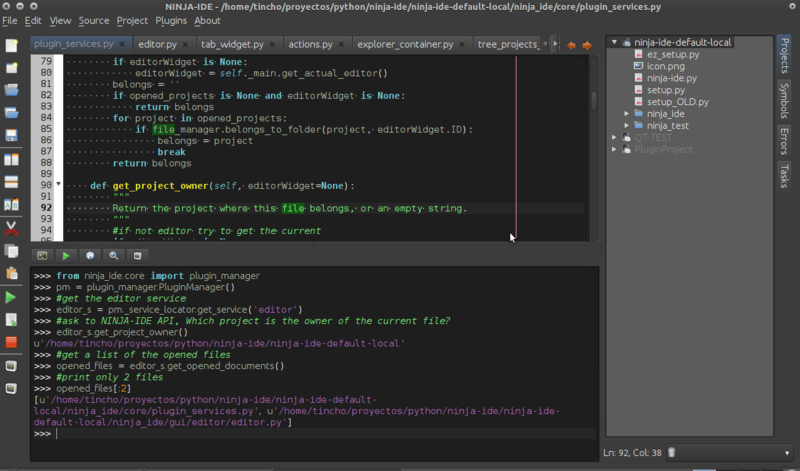 NINJA-IDE only handles symbols for Python files, but we can add handlers for different files. You have to move your plugin code and the plugin descriptor file to ~/.ninja_ide/addins/plugins/. Re run NINJA-IDE and see what happens. You have to install the official pluginProject plugin, create a new project, select the NINJA-Plugin-Project -type and follow the wizard. When you’ve finished the wizard, the new project will be opened and some code will be included into some files. Go to the root of the project and right-click in it. Go to “Plugin Tools” and then select “Test this plugin on NINJA-IDE”. This will launch a new instance of NINJA-IDE with your plugin. When you install/test a plugin, it could fail. If the plugin fails, NINJA-IDE shows you a dialog with information (plugin name and traceback) about it. The image below shows how NINJA-IDE reports plugin errors.